This delightfully illustrated book contains more than seventy-five of the best-loved rhymes and songs of childhood, from soothing lullabies to schoolyard chants. Popular classics such as "Pat a Cake," "Humpty Dumpty," and "Jack and Jill" are joined by lesser-known rhymes and ditties from many different cultures. Kady MacDonald Denton's illustrations add liveliness and humor. 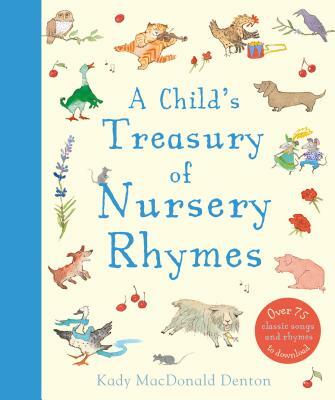 Together, parents and children will enjoy sharing A Child's Treasury of Nursery Rhymes. Kady MacDonald Denton has illustrated numerous titles for Kingfisher, including A Child's Treasury of Nursery Rhymes, In the Light of the Moon by Sam McBratney, and two collections written by Ann Pilling, The Kingfisher Book of Bible Stories and The Kingfisher Treasury of Myths and Legends. She is also the creator of several picture books. She lives in Manitoba, Canada, and received the prestigious Governor General's Award for her work.